Harold H. Catlin | Fallgatter Catlin & Varon, P.A. Harold H. Catlin is a lifelong Jacksonville native, and has been practicing law for over 30 years. 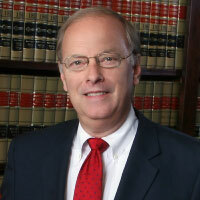 He is a member of both The Florida Bar and the State Bar of Georgia, and has handled litigation and appeals throughout both states. Mr. Catlin specializes in civil litigation, including personal injury, wrongful death, commercial issues, insurance coverage, medical malpractice and product liability. He is past President of the Jacksonville Bar Association, the Jacksonville Association of Defense Counsel, and the Museum of Science and History. He has been actively involved in numerous legal, civic and religious groups in the community. He is also a Certified Mediator in Florida.